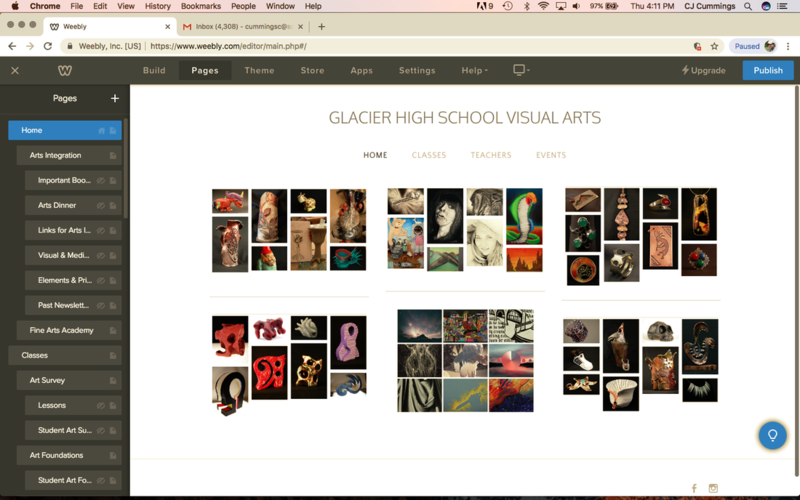 Building a good online portfolio is a great way to share your work with everybody. You can link to it on resumes/job apps, college applications, scholarship applications, your mom's fridge, places like that. You'll also be using your website to turn in every assignment for this class, so please follow instructions carefully. There's a lot here, so it would be a good idea to read this all the way through once before you begin, then again piece-by-piece as you go through each step. Go ahead. Read through the whole thing. I'm in no hurry. I have plenty of time to wait. 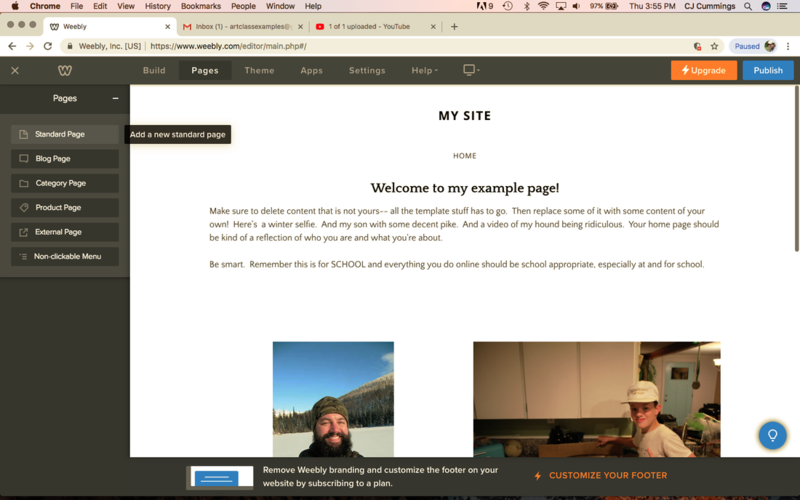 Go to weebly.com and click "sign up" (at the top right of the screen. Use your school gmail account for all of your login credentials as you set this page up. In the future, when you're logging in, you'll be able to click a shortcut and not have to enter your email and password every time you want to edit your weebly site. REMEMBER your password. If you forget it, I can't help you. I suggest you email your password to yourself. Then you'll have it saved in your sent messages and in your inbox. Choose the left option: "I just need a website". You're not making an online store here. 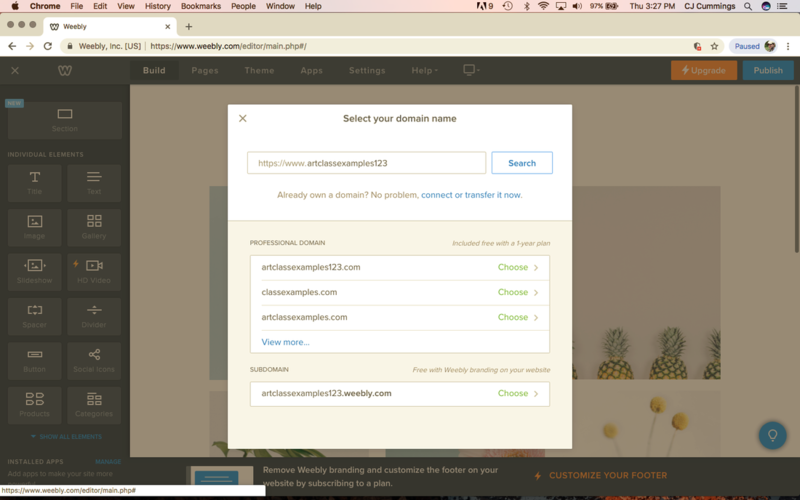 ​​When creating your url, you're creating a web address. Be descriptive without using your last name. 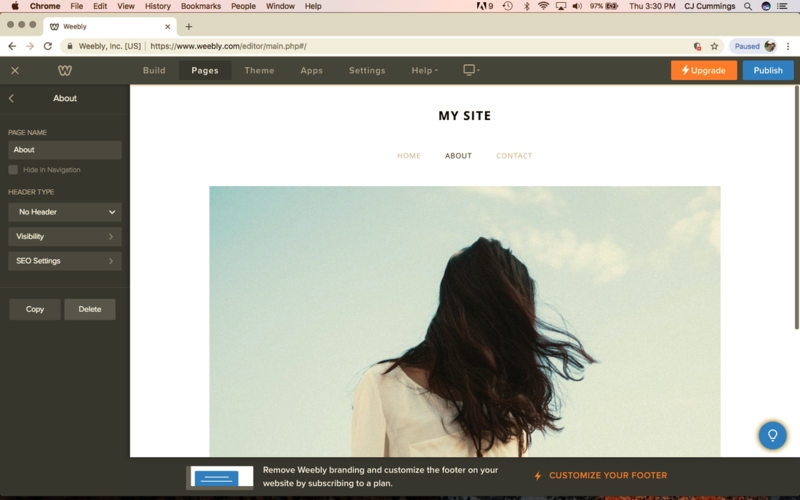 Choose the "subdomain of Weebly" option. That way you don't have to pay for web hosting. ​So if your name is Billybob Smith, you might (consciously omitting your last name for safety and privacy) choose "billybobsphotos" so your url will end up being "www.billybobsphotos.weebly.com". Time to pick out a template. Just kidding! I've chosen one for you. I want a clean, simple, easy-to-use template with a minimal amount of content that you need to delete. Yes, you will need to delete content from the template that's not yours. So, under the "PORTFOLIO" tab, choose the top left option: Modus Operandi. It's clean, simple, and one of my favorite Latin phrases. Sorry Jellyfish! Sorry, hipster mohawk guy! Sorry, Sarah Smith the creative director. Today is not your lucky day. Better luck next time! Then click that blue "Start Editing" button on the top right and you're ready to get started. 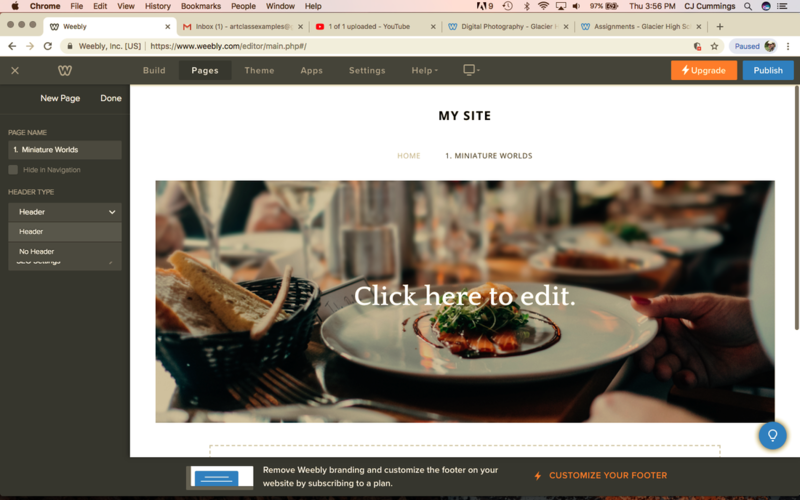 First, a little background knowledge: 99% of your time editing on Weebly will be spent in those two top left tabs: "Build" and "Pages." 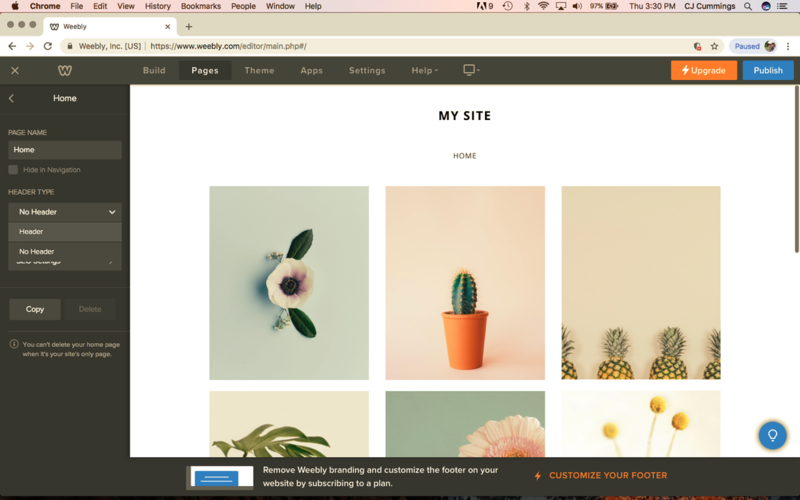 When you create a new page for your site, you'll click the + button, then choose a NEW STANDARD PAGE. You'll name it after whatever assignment you're posting/submitting. Notice the heirarchical structure of the tabs on the left. If the tab is all the way to the left, it appears as a heading on the home page (See-- Home, Classes, Teachers, Events in this case.) If the tab nests to the right of that, it becomes a subdomain of that page and so on. 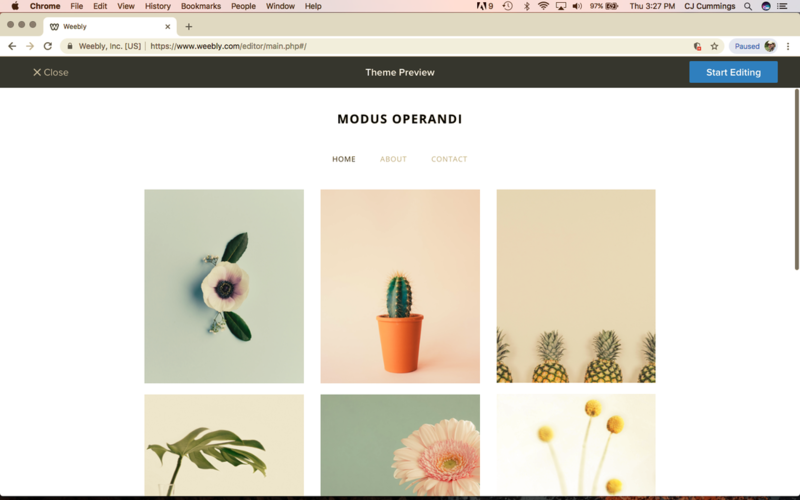 When you create a page, then you'll drag and drop things like text boxes, images, galleries, titles, stuff like that onto your page and add content that way. All those tools are under the "Build" tab. By default, your template will give you three pages: Home, About, Contact. To delete these pages, click on them (on the pages tab) and it will take you to the page you clicked on. The delete button is in the lower right part of the page tab. 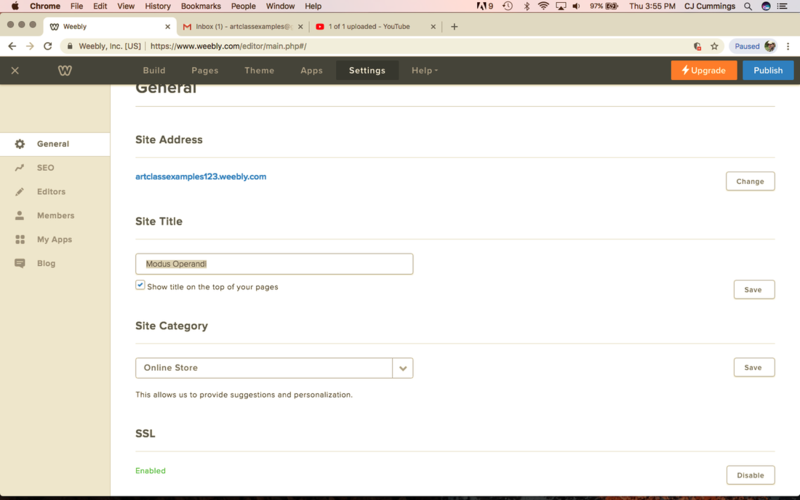 When you're left with just the "Home" page, make sure you select "No Header". Then get in there and start deleting all those stock photos. Sorry lonesome cactus! Sorry strangely-cropped pineapples. You are dead to us. Now that you've cleared off all non-original content, change your site title. That's in the Settings tab. You can change it to whatever you want, or you can just un-check the box that says "Show title on the top of your pages." Go back to your home page and build it out a little bit. Intro paragraph? Don't mind if I do! A few fun pictures? Sure, why not? You can even embed Youtube clips if you want. Here are the criteria for your home page: It needs to be relevant (for/about you), it needs to be your own original content (not random downloaded memes), and it needs to be appropriate. For additional pointers, check out my example page here. Assignment 1 is called "Miniature Worlds." Notice that I made sure "hide in navigation" was not checked and that I changed the header to "no header". You can begin pre-building all of your assignment pages now. Set them all up this way. As you complete each assignment, you'll turn it in by posting it to each assignment page you've created. When you're all done, click "Publish" on the top right. That saves your changes and makes them visible to viewers online. You'll receive a notification that says you published. It will also show you your URL (or web address). It's the blue text. You need to email me your url. Copy it (remember: The BLUE text, not the address in the address bar at the top of the page. 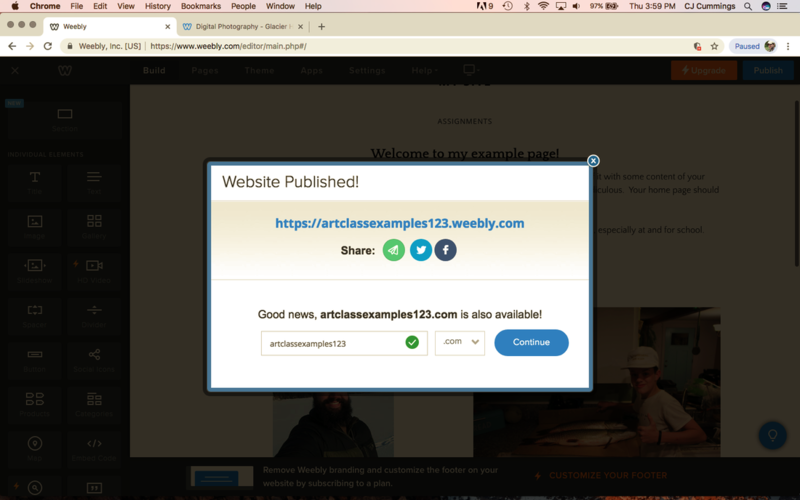 In this case, the part to copy says "https://artclassexamples123.weebly.com". Highlight, (command+C to copy), then email it to cummingsc@sd5.k12.mt.us. (command+V to paste).